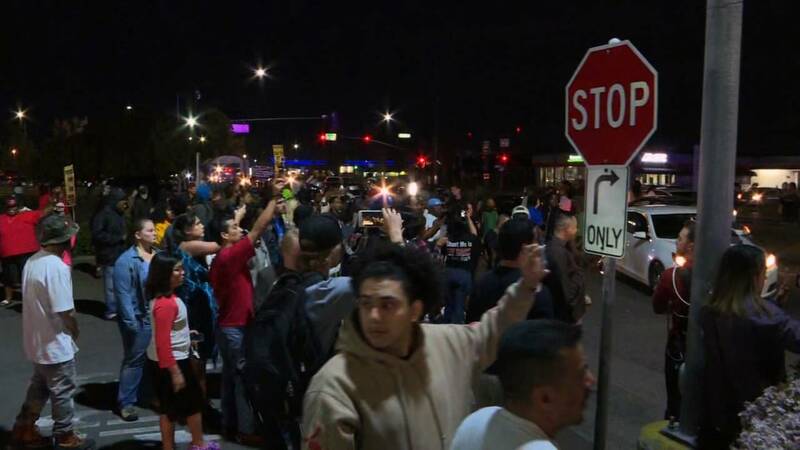 Protests in Sacramento, California grew tense late Saturday night, March 31, 2018 as police moved in to help keep the peace. (CNN) - A Sacramento County sheriff's deputy struck a protester with his patrol SUV as she and others gathered in the street to denounce the killing of Stephon Clark, then left the scene, according to video of the incident. The incident Saturday night threatens to exacerbate an already tense relationship between police and protesters in California's capital. Observers say the deputy struck the woman at a high rate speed of speed, while authorities say the vehicle was moving slowly and the deputy was responding to a dangerous situation created by some of the demonstrators. "This is their response to a community in outrage and pain; this is ​just ​another glaring example of the ​reckless nature of Sacramento law ​enforcement," said Tanya Faison, founder of Black Lives Matter's Sacramento chapter, which did not organize the event but has been vocal about Clark's killing. "We will continue to demand justice for not just Stephon, but for all lives that have been unjustly taken at the hands of law enforcement." During a vigil, a woman carrying a "Stephon Clark Rest in Power" sign walked in front of a sheriff's vehicle and motioned the driver to stop, according to a video from the National Lawyers Guild Legal Observers. The deputy then drove away, said Guy Danilowitz, a legal observer who recorded the video. "The vehicle accelerated and struck her, accelerated very fast and struck her violently and she fell to the ground," Danilowitz said. "It was a very fast acceleration, not the way you would move with people around." The woman suffered minor injuries and was taken to a hospital, according to the Sacramento County Sheriff's Department. About eight seconds before the collision, a deputy inside the SUV was heard over a loudspeaker repeatedly telling protesters, "Back away from my car." The Sacramento County Sheriff's Department said protesters approached the vehicle and "began yelling while pounding and kicking the vehicle's exterior." "The collision occurred while the patrol vehicle was traveling at slow speeds," said spokesman Sgt. Shaun Hampton. He said the deputy's vehicle had scratches, dents and a shattered rear window following the collision. "The damage to the vehicle was not a result of the collision involving the pedestrian but was caused by vandals in the crowd," Hampton said. Several demonstrations have been held in Sacramento since Clark's deadly encounter with police two weeks ago. Police fatally shot Clark -- an unarmed black man -- in his grandmother's backyard March 18. Officers said they thought Clark had a gun, but only his cellphone was found at the scene. Last week, protesters gathered in front of the Sacramento County District Attorney's Office holding their cellphones aloft. They have also blocked fans from entering NBA games and joined Clark's brother as he interrupted a City Council meeting and chanted his brother's name. Hours before Saturday's incident, former Sacramento Kings forward Matt Barnes led demonstrators in a rally with Clark's family. "It's more than color," Barnes told the crowd. "It comes down to wrong and right." He also announced he was starting a scholarship fund for Clark's two sons. Attorneys for Clark's family said at a news conference Friday that the autopsy results contradict the account of the shooting presented by Sacramento police. The initial autopsy conducted by the Sacramento County Coroner determined the cause of Clark's death as multiple gunshot wounds, and the manner of death was homicide, according to a preliminary report. Authorities have not released the full report. "The narrative that had been put forth was that they had to open fire because he was charging at them," said Benjamin Crump, one of the Clark family's lawyers. "Well, obviously, based on Dr. Omalu's findings and the family's autopsy, it suggests all the bullets were from behind." Police released footage of Clark's shooting 72 hours after it happened. In the video, someone can be heard telling officers to mute their body cameras. The comment comes about seven minutes after Clark was shot. Sacramento Police Chief Daniel Hahn told CNN he doesn't know why the cameras were muted. Officers are allowed to do so in specific situations, like when they're talking to a confidential informant.